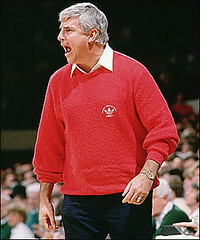 It came as a shock to me tonight when my brother Matt texted me simply, "Bobby Knight Resigned." The ESPN story says a lot, but it doesn't say it all. He won more games (902) than anyone else, but he did it in a way that created controversy as well as excellence. He was the best X and O coach ever, but often had to do it without the top level player. His legendary temper may have driven some of the best players away, but he had the ability to raise the level of everyone around him by simply demanding more that anyone ever had or ever would again. His mouth got him run out of Indiana. He ended his career in Lubbock, Texas, having put Texas Tech on the basketball map. Tonight he walks away from all of that, handing his legacy over to his son and long-time assistant Pat. The younger generation Knight is a softer rendition of his legendary father. He coaches in a quieter way, hardly causes a stir in the press room, won't ever throw a chair or take a swing at a cop. Pat Knight now steps out of his legendary father's shadow. I only hope his father can live without the glare of the lights and the roar of the crowd.